(1)Analog input: 6-way 12-digit analog data input, built-in 250Ohm resistor，standard input of 4~20mA(1~5VD) or any input in the range of 0-20mA. 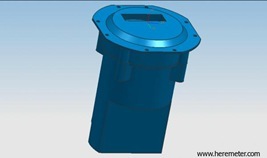 The measurement range and zero point can be set discretionarily. (2)Pulse/switch input: 6-way pulse/switch input which can be set by software. (3)2 relays (220VAC1A) dry contact output. ON/OFF the relay by GSM telemetry setup, and can also set a certain alarm to operate relay. (4) A 24VDC(I<45mA) output can provide power source for pressure transmitter and other small type instruments. The function is available while battery powered. (5)An isolated RS232/485port can be used for setting and reading, e.g. 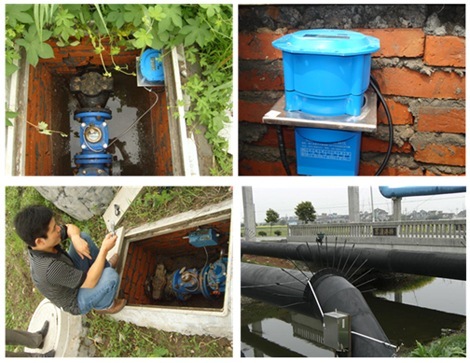 ABEST flowmeters are directly data logged. (The flowmeter must have standard RS232/485 Port and communication protocol). ● Alarm function：alarm for switch status (e.g. for power ON/OFF)，for upper/lower limit, for abnormal flow rate, those alarm messages will be informed by GSM and telephone. Four alarm telephone numbers can be set. ● Function of data saving. The data saving interval time can be set from 1 minute to 2hours. Can store 14336 pcs of data，users can see about valid history data by fuzzy inquiry. ● While uploading data, uses can set four reception telephone numbers and 2 IP (GPRS) to meet different request. The uploading time can be set in 15s to 1day. ● Real time data inquiry (no saving energy mode) and reservation inquiry which is energy saving mode: each other 3 days(1、4、7…) will open 6 minutes to automatically receive and handle sent messages. The open time can be set. ● For saving cost, one message can contain multi-time data. For example, when want to receive one way flow totalizer, one message sent per day, but the message can contain totalizer of every half an hour. ● The function of data compensation means: if you fail to send the last data, it will compensate it after successfully sending it next time in the valid time. ● Data LCD display，the keypad only for inquiry. ● A friendly interaction with mobile phone，and password validated. 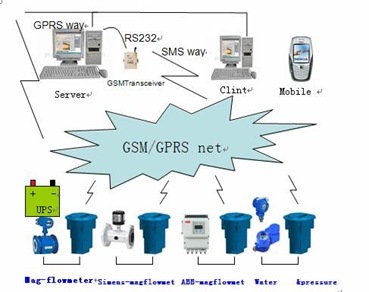 All data parameters can be set by GSM. ● Support GSM900MHZand EGSM1800 double frequency MH (Utilize standard of GSM Phase2/2+). ● Power：Built-in battery (DC7.2V) and external power (DC8V~26V). ● Active pulse(valid voltage>5V，invalid voltage<0.5V). ● Analog inner resistor 250ohm, standard 4~20mA(1~5VDC)input，and 0~20mA(0~5VDC) is all right, too. ● RS232/485：default 38400-8-N-1. For direct data logging, it may need to change software depending on instruments. Actively uploading data at definite time. Path set as two channels pulse, four channels analog(Q：113333). Positive totalizer, negative totalizer, net totalizer, instantaneous flow rate，signal quality,tec. Note: while applied here, the version no is different. Pleas kindly indicate it while order.